Discord stood looking at the Spring of Eternity and he scratched his head. Twilight Sparkle stood next to him as she tried to make sense of why the spring was not producing any more water. “So it stopped? Just recently?” She asked. “Maybe we will have to shrink ourselves down and follow it to its source. No, that would be … crazy.” He muttered as he started to smile. “You said we should shrink ourselves down.” Twilight stated. “If you heard me, why did you ask ‘what’?” Discord chuckled. “No, but what would be the harm? Besides getting smashed, eaten, maimed and many other horrible circumstances, I don’t see why not?” He grinned at her. “Aunt Twilight, why would you even begin to consider it?” Paradox asked as he looked at his father and aunt. 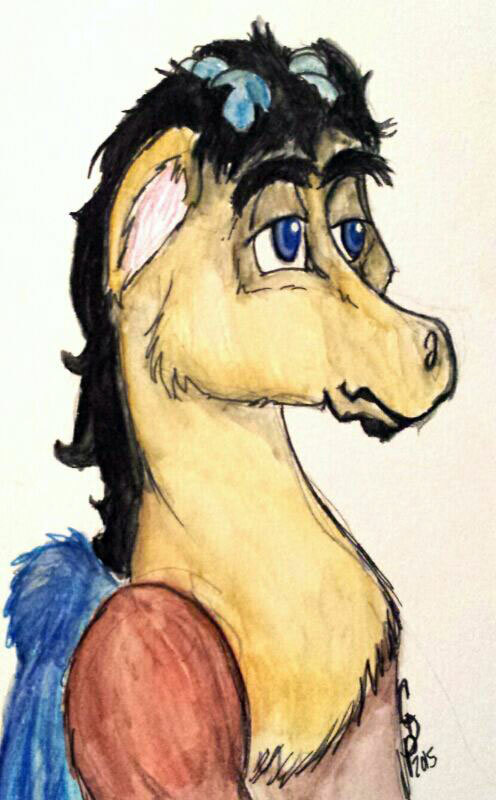 “Dox, with my knowledge of the spring, I believe shrinking is the only option.” Discord said. “Also I have always wanted to see little itty-bitty ponies.” “Well, Silver Dash is not going.” Paradox said. “Well, I don’t know.” He snapped his fingers turned smaller snapped them again became giant sized then he slowly became normal size. “Yes I know Twilight, but you see I have two of my children here and they can do chaotic magic as well.” He grinned at his son and daughter. “I am not going in that small hole.” Paradox muttered. “That isn’t what you said last night.” Silver giggled. “See now you are poking your fingers in strange holes.” Silver muttered. Discord smiled as he snapped his fingers and shrunk down. “I guess. I’ll have to shrink you all down?” Twilight grumbled. “No way.” Paradox said as he put his paw on Silver Dash and they both shrank. Zero flapped his wings. “What? Oh, wait a minute…” Lilly clicked her tongue and he shrunk while protesting. “Okay then. 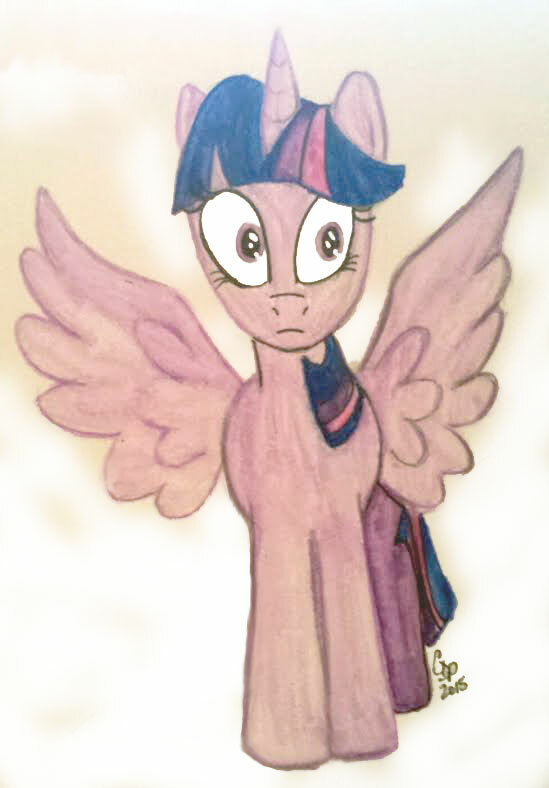 See you later Lilly.” Twilight took in a deep breath as she used her unicorn magic and shrunk down. Flight Strike swallowed hard as he looked at the door in front of him. He knew that his father-in-law and the rest of the family were in the waiting room. He looked behind him and then forward again. They deserved to know. He placed his hoof on the door let out a deep sigh and pushed it open. Every pony looked up expectantly at him. “Hey, um…” He began but was suddenly interrupted when Discord put his paw on his muzzle. He noticed the whole room was frozen in time. “Dad… I’m… so tired. Help me.” She was sweating and her eyes were blind. “Do what you can.” Epona said. 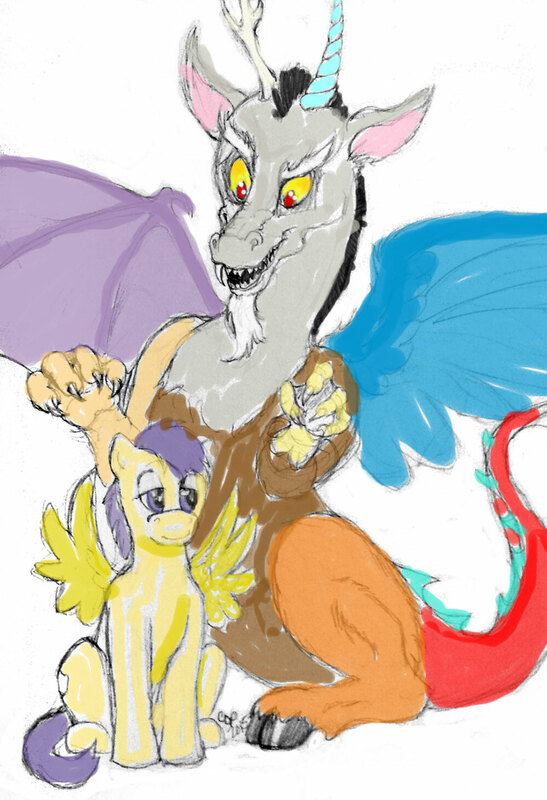 “Here’s trying.” Discord placed his paw on his daughter’s forehead and closed his eyes. “AH!” Scarlet Grace screamed loudly. The foal in the bassinet started to cry loudly and Flight Strike went to stand near his wife and put his hoof on her paw and endured the sound of her screams. “I… I…” Scarlet looked over at Flight Strike. “Flight… I love you…” She suddenly slumped; her eyes closed. Discord felt his chest tighten up. “No…” He whispered. “No. I don’t like getting dirty.” He muttered as he rubbed one of his eyes. “I’ll leave the stress to you.” He shook his head and turned his attention to his daughter. “Trouble?” Discord’s ears went up as he brought the foal to his daughter. Flight nodded as he followed Discord out the door, he then blinked when time started up again and Discord disappeared. Walking to the door of the waiting room he took in a deep breath and opened it. “Hey.” He said to the ponies waiting. Taking a vacation from the office wasn’t a good idea now that she thought about it, since she’d come back with a little more than just a souvenir. Epona felt so uncomfortable today as she slowly opened the door to the examination room. “Good morning,” She said cheerfully and stopped when she saw LillyRose sitting on the examination table. “Lady Chaos…” She suddenly bowed. “Dr. Epona, please don’t bow, geez you helped bring me into the world.” Lilly sighed. “Lilly, you’re pregnant?” Epona asked as she looked at Lilly and saw her little belly bulge. “I see, so where is the father?” Epona asked. “Oh, whose guard was he before?” She asked while she started the examination on Lilly. “Oh… I see…” She grinned as she brought a stethoscope down to listen to her. “Dad is very observant apparently.” She blushed again. “Yes. How did you know?” Lilly asked. “Lucky guess,” She shrugged. “Father’s always have a sixth sense when it comes to their daughters. Especially to the ones they are the most connected to. You are like him in so many ways. Lady Chaos.” Epona winked. “That title… I sometimes like it but sometimes it irritates me.” Lilly sighed and jumped when Epona strapped an instrument to her belly. “Okay, let’s see.” Epona said cheerfully as she moved a wand over Lilly’s stomach. “Oh… that narrows it down. Thanks doctor.” Lilly replied sarcastically. “Dad is here with mom in the other exam room.” Lilly stated. “At her age?” A look of worry went across Epona’s face. 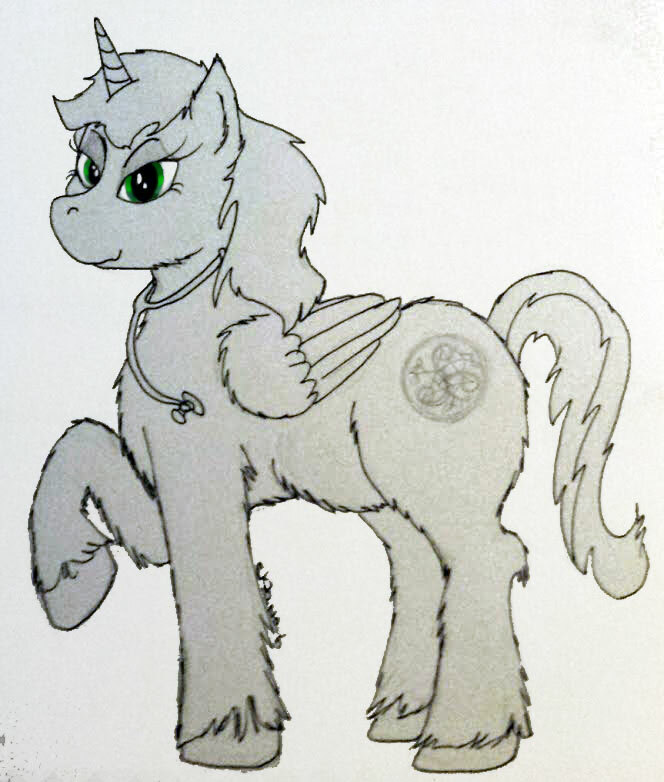 “As I said before, I’m an Alicorn.” She smiled. Paradox gave her an “are you kidding” look. “Oh… I knew…” He poured syrup on his pancakes. He smiled when Fluttershy and Discord walked in. “Mom can Silver come in and eat with us?” “Sure Doxy.” Fluttershy replied and she suddenly smiled when she saw Lilly. “LillyRose, I am so happy to see you.” She trotted over to Lilly. “I’m happy you’re back. We all missed you. Scarlet Grace is almost due, and I heard you had an eventful first few weeks this month.” Fluttershy was tearing up at her daughter. “I would’ve wanted to see you get married. I wanted to help you get ready for your marriage…” She moved her hoof up and wiped her eyes. Fluttershy looked at Zero. “I never really got to meet you.” She said to him. Zero blinked. “Yeah, I uh, I… I am so glad to meet you. Lady Fluttershy.” He bowed to her as well. “Titles like that aren’t meant for family.” Fluttershy blushed and giggled. “And you are now family. You can call me Mom.” She went to over and gave him a hug. Zero had a look of shock on his face as Fluttershy hugged him gently. She looked around and saw that Silver Dash had walked into the room and Paradox gave her a huge hug. Silver sat down beside Paradox and looked at him lovingly. “Thank you Lady… I mean… Mom.” Zero blushed a lot. Fluttershy blushed and looked at Discord and then back at Lilly. She was about to answer her when Paradox started laughing. “Don’t be silly Lilly! Mom can’t be pregnant.” He picked up a pancake to put in his mouth. Silver Dash started to giggle at Paradox’s reaction. “Only a month at least.” She blushed as Discord started to pet her mane. Paradox seemed to shrug as he went back to eating; thinking that none of this concerned him that much. Paradox looked at Silver after he shoved a pancake in his mouth. “What?” He asked with his mouth full. Silver shook her head and was blushing profusely. “Nothing.” She stared at her plate as her cheeks burned with a blush. “If you say so.” Paradox grinned as he stuffed another pancake in his mouth. “I’m going to go to Ponyville in a couple days to see Dr. Epona Calliope. Want to come along? She’s been taking care of Scarlet Grace.” Fluttershy offered. Discord had his mouth full since he decided to eat while they talked about pregnancy. “Mmm?” He looked at her. 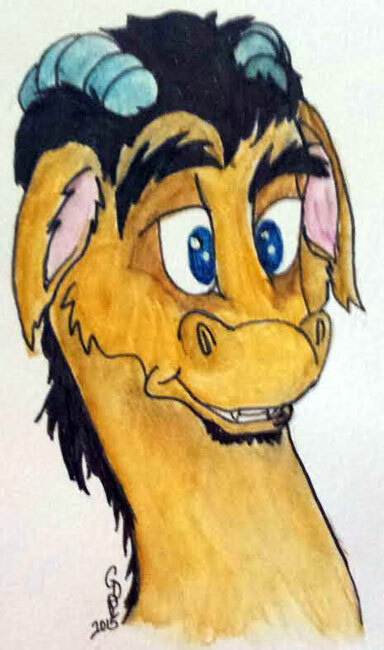 Discord smiled. “What? Being your guard?” He started to laugh. “I don’t think so. Being married to your guard is a big distraction.” He stared at Zero for a long moment. Zero gulped at Discord’s stare. “Um… I wasn’t really expecting to be Lilly’s guard again Sir.” Zero replied. Lilly landed on the balcony of her tower. She glanced around and waved him down as she trotted to her door. Zero landed not too gracefully on the balcony almost falling on his face for the third time in a few days. “Hurry up.” Lilly whispered as she opened the door to her room and was waving him in. “I’m sorry, these wings.” He whispered back as he ran into her darkened room. She followed him in and closed the door. They had been gone for about a week since getting married and Lilly was worried about her sister too much to be gone for longer. “Why is it so dark in here?” She asked. Lilly used her magic and lit a candle she knew she had nearby. The light of the candle revealed a looming figure of Discord standing over Zero. His claws out and ready to grab him as he had a malevolent grin on his face. She whinnied in shock and the candle snuffed out. Zero wasn’t sure why Lilly whinnied and why she put the candle out so fast. “Dear? What happened?” He blinked into the darkness then a chill ran up his spine as he felt a paw placed on his shoulder and he froze in place. “Horse nuggets…” He managed to mutter. “Horse nuggets indeed.” Discord said. “LillyRose?” The candles in the room all lit up at once. “She said she wouldn’t tell him.” Zero said but flinched when he felt one of Discord’s claws dig into his shoulder. “She didn’t tell me. She told your mother.” He growled deeply. “While I was in the room, in her own special way. Even revealing the fact that you’re pregnant as well.” He looked at her. Discord grinned and let Zero go. “I know you do.” He then looked at his daughter. “Lilly in the morning, bring your new husband down with you to breakfast. Your mother needs to tell you some news.” He then snapped his fingers and disappeared. Zero’s legs shook and he collapsed on to the floor. “Holy horse nuggets.” He whispered as he stood up again. “Lilly, I’m tired, but not that tired.” He kissed her and they both went to bed together. “Yes, I know.” Discord chuckled. “That sounds really nice.” Fluttershy said. Fluttershy blinked and suddenly looked at Bleak Claw and at Misery. “My baby eloped? 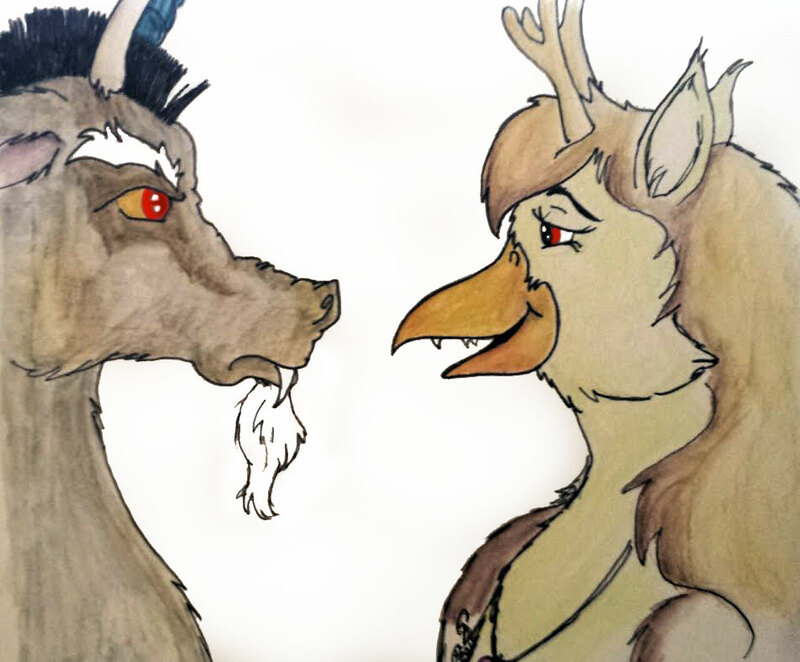 Discord!” She looked at him and he was frowning. “I get it Fluttershy.” He growled as he looked at his sister. “You’re not really going to kill Zero are you?” Fluttershy asked. “Mom?” Paradox looked at Fluttershy. “Missy, I’m just getting my second wind. I just have a lot on my mind right now; you just added a couple more things to it. Merci bien.” Discord seemed to say the last thing sarcastically. “De rien.” Misery replied back and just grinned at her brother. Twilight had helped Discord through the day with the politics of the kingdom. “Thanks Twilight, that was helpful of you. 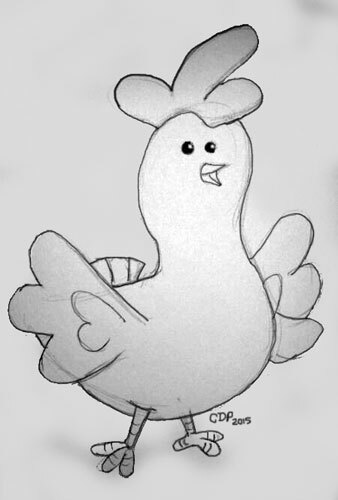 Thank goodness you knew some of those answers because I think I would have just turned them into a bunch of chickens.” He muttered as he yawned and stretched on the throne. He looked at her and grinned. “Oh… no… never.” A halo slowly formed over his head and it twisted slightly then tilted. “Why don’t you think the water will help?” Twilight asked. “It’s a risk I am willing to take.” Twilight stated. Twilight looked at Discord’s sister and backed away. Discord’s sister made her very uncomfortable. “Um, bye Discord, see you later. Say hello to Fluttershy for me.” She then blinked out. “Oh! So you’re enjoying the princesses time then? Having some alone time with them?” She teased and nudged her husband in the side. Bleak Claw just righted himself and fluffed out his feathers. “Just keep telling yourself that Dissy, that princess was looking at you like she wanted you.” She teased more. Discord’s eye twitched. “Twilight? No, I fully doubt that. Come on, dinner will be ready soon and I still have to make the sun set.” His sister still made him annoyed and what she was suggesting was ridiculous. “Twilight is just a friend. A best friend to Fluttershy, come along.” He strode out of the throne room past his sister and didn’t wait for her to follow him. 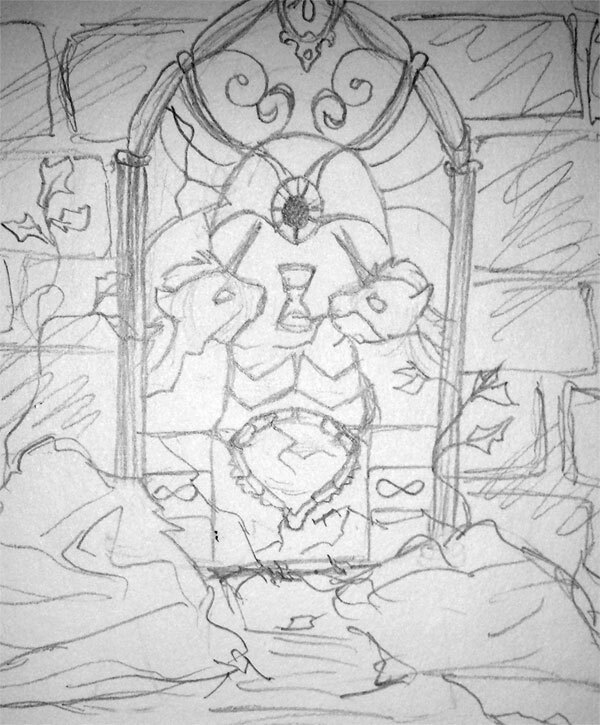 Misery was looking at the shops in Canterlot, she really wanted to go to the castle and bother her brother. Bleak Claw wanted to find something for her though in the shops. So she let him lead her into shop after shop. She was getting tired though. She knew that Gryphons liked bright shiny things but he was putting a lot of gold baubles on her and it was weighing her down. “Oh! Dearest you promised her you wouldn’t tell him.” The Gryphon blinked. 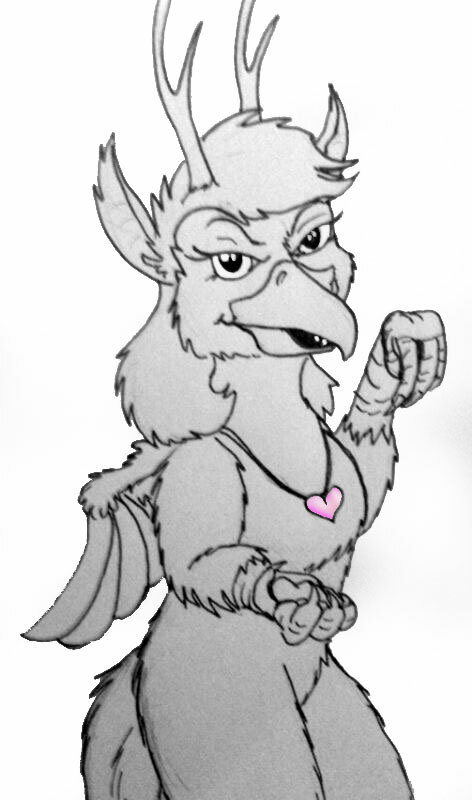 “I have married a truly evil female.” Bleak Claw shook his head as his feathers fluffed out. “Yes, but I make things exciting.” They started walking to Canterlot castle. “Sure, but not today. I have a few things on my plate right now.” Discord sighed heavily. Twilight suddenly noticed that Discord didn’t look as energetic as he usually was. “Are you alright?” She asked concerned.